Can I move my form to a new account? I created a form for a nonprofit organization under my work account (as opposed to opening an account for the org). I now realize it will be to their benefit to have a separate account. Instead of redoing the entire form (eval tool), is there a way to transfer it to a new account? You will then be redirected to the imported/cloned form in edit mode. The form is automatically saved in your account. Let me know if you have some more questions. I want to copy a form or duplicate a form into a different account. Not within my account. Thanks for your reply, I do apologize for not making it clear. 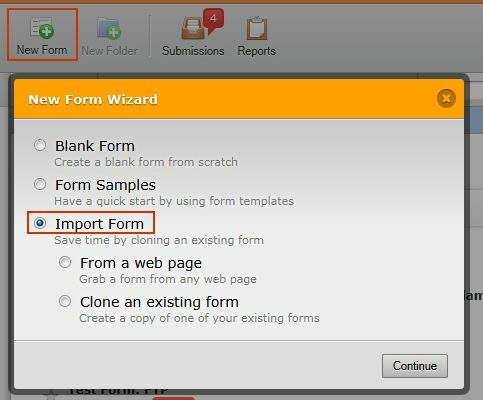 If you would like to copy your form to your 2nd account then just get your form url from your 1st account. And then use my guide above on how to copy the form. I hope this makes us clear.